OSA Archivum has already organized several exhibitions on preservation, classification, collection and sharing. It also ran projects involving unread books. The Dead Library is the latest event in the series. The exhibition is a library installation, showing a typical local library. 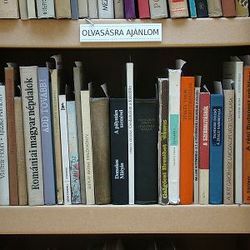 The 300-square-meter space is dominated by bookshelves, on which the books are arranged in the standard library thematic order from technical and agricultural works through youth literature to arts and fiction. The only difference between a traditional library and the Dead Library is that visitors will find only unread books here – ones that have not been checked out since 1989 (or longer). Visitors taking one book or another off the shelves will become their first readers in decades. Our hope is that the Dead Library will inspire public thinking on libraries andarchives, the preservation and re-use of information, and, by making the thousands of books available for browsing and reading, it will give visitors and readers the exceptional experience of re-discovering books otherwise destined for oblivion. We wish to express our gratitude to the management and staff of ELTE University Library for making their huge collection available for selection and for their invaluable advice in the course of the work. The exhibition runs until April 22, 2012, from 10 am to 6 pm every day, except Monday. Entrance to the Dead Library is free. Galeria Centralis, 1051 Budapest, Arany János utca 32.